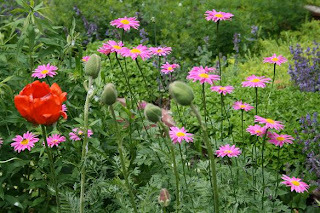 Amy's Creative Pursuits: The Late Spring Garden: Irises and Poppies! Well after four days of rain, my garden is looking pretty lush and green, so I decided to go and take a few pictures. I ended up taking 72 pictures because everything was just so breath-taking! I can't possibly show you all 72 pictures, so I will just spend the next few days highlighting certain species of plants. 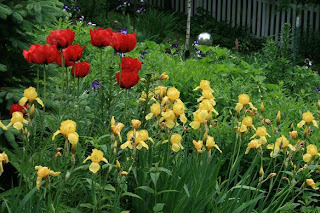 Today I will show my poppies and irises! And for those of you that are only interested in paper-crafting, don't worry, I'll have a have posts in-between my gardening pics to exclusively devoted to cards! 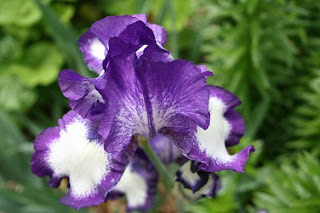 I have many different types of iris in my garden. Most are purple or yellow. 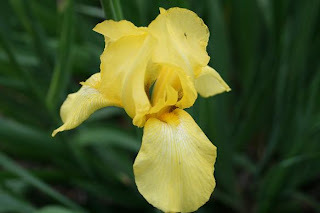 The first picture shows a very common, old-fashioned yellow iris. 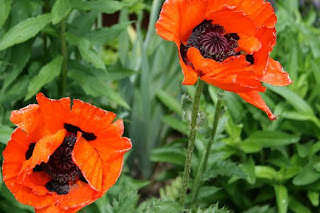 My orange poppies are in bloom! I love poppies! They are such a gorgeous flower. If only they would last longer! Here they are mixed with some beautiful pink daisies and also a close up so you can see the center. 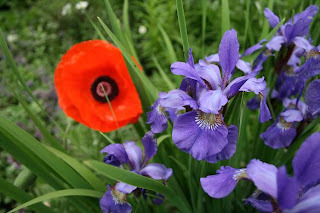 Here is a close up of a red poppy, and below is a picture of a orange poppy next to some purple Siberian Iris. The picture on the left is a far away shot of my red poppies and yellow iris, and the picture below is a close up of Siberian Iris. 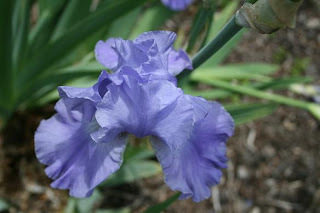 This is a rare blue iris. One of my favorites! The purple iris below I have a ton of! Its absolutely gorgeous and the scent is intoxicating! And finally a far away shot of my Southeast Garden. My gorgeous Honeylocust tree is still yellow. Notice the HUGE Allium globes? I love that plant! And the puffy white plant in front of the tree is Goatsbeard. Today I'm off to work, but tomorrow I'll be back in paradise....my garden. Your garden is just breathtaking! 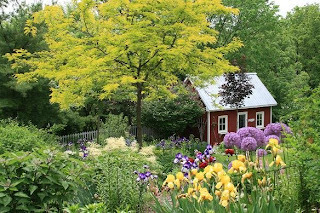 Your gardens are just GORGEOUS Amy!! Thanks so much for sharing them with us! I too LOVE iris ... don't nearly have as many as you do but I certainly enjoy the few varieties I do have! How breathtaking it must be to look out your window!!! Thanks Amy for sharing pics of your garden. I for one could look at all 72 of them ! Absoulutely beautiful ! You take such fab photos of your flowers. 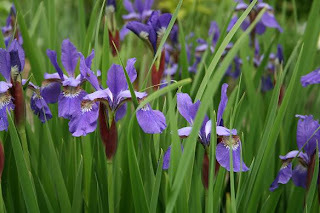 They are all so lovely but I think I'm most enamoured of the blue iris. What a gorgeous color. Can't wait to see your other photos. Amy, you garden is GORGEOUS and the pictures are absolutely Stunning!! 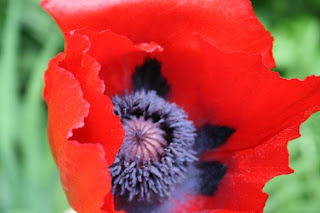 I don't have poppies but my parents do and they were so beautiful this year but only for a few days. I was going to go over and take some pictures and the night before it stormed and that pretty much wiped them out. All of your Irises are so beautiful too! Mine are just starting to bloom. Thanks for sharing your pictures!! Absoutely beautiful - can see why you took 72 pics! Love the view of the SE garden! Gorgeous!! I love when you show pics of your garden. So awesome!